Twitter is a relatively new but vastly popular social medium. Combine that with being a young athlete with confidence and cash and you have a potentially explosive situation. It's a 24/7 world that provides a "no holds barred" social microscope. For every true blue fan that follows an athlete on Twitter there are just as many waiting and watching for him to mess up so they can pounce on it. Sports franchises pay big money to market their brand and protect its integrity. It only takes one careless tweet to destroy a brand very quickly. Many careless tweets by athletes have resulted in fines, suspensions and discussions about team social media bans as well as league-wide bans of Twitter. Sports figures are even hiring social-media experts to keep them out of trouble. Case in point: Young Tyler Seguin (@tylerseguin92) tweeted Saturday “Only steers and queers in Texas, and I’m not a cow.” (He has, famously been traded to Dallas recently from Boston) This, after he previously tweeted a homophobically perceived tweet in April of this year. The April incident came on the heels of the NHL becoming the first professional sports league to partner with the gay rights organization You Can Play. At the time, Patrick Burke, who is a leader in the social activism campaign had to talk to Seguin. The Bruins made a non-comment statement and You Can Play made a statement about how Tyler made a mistake but he’ll learn from it. And yet, here we are again. Seguin, it seems would do well to spend less time with his twitter-hacking friends and more time working on his game. 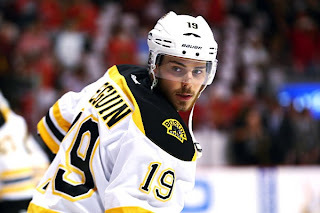 For most of the crippled 2013 season, well-placed sources have been predicting that Tyler Seguin’s days with the Bruins were numbered. He was demoted to the third line. He was underachieving on the ice but making immature lifestyle choices off the ice. A source from within the Bruin’s organization said they made the decision to part ways now with the No. 2 overall pick in the 2010 draft, as they felt is headed for trouble with his nightlife pursuits. That claim throws gasoline on the rumor that during the playoffs the Bruins forced Seguin to stay in a hotel even when in Boston so they could post a guard outside his door to enforce curfew. “I don’t want to really play that up too much,” Peter Chiarelli said. “He’s a 21-year-old that played as an 18-year-old, and I think he was just a 21-year-old kid. He was maturing and growing up, and he liked to have fun like the rest of them. I don’t really think it was such a big deal. But when I said earlier about focus, just about little things, about preparing to play — it was nothing about extracurricular activities. Seguin’s mother further claimed her son was not happy to be traded out of Boston but he is a “professional in capital letters.” Jackie told the Star that Boston’s intense media spotlight makes it a tough hockey city, especially when unsubstantiated stories leak out. In Dallas, her son is bound to flourish because he won’t be under the microscope. No one has faced more time under the microscope than Sidney Crosby. Yet, have you ever read a single story about him drunk in public or punching a cab driver? No. He embraced his talent and takes serous his position as a role model and captain of the Pittsburgh Penguins. His parents are present in his life but he’s never given them a reason to be outraged in his defense. It would behoove Tyler Seguin to take a page from Sidney Crosby’s book and be silent off the ice while letting his talent do the talking on the ice. After Seguin issued his most recent apology, he announced he would be shutting his twitter account down “for a while”.